This week’s recipe is short and simple, but a great staple for any day of the year. 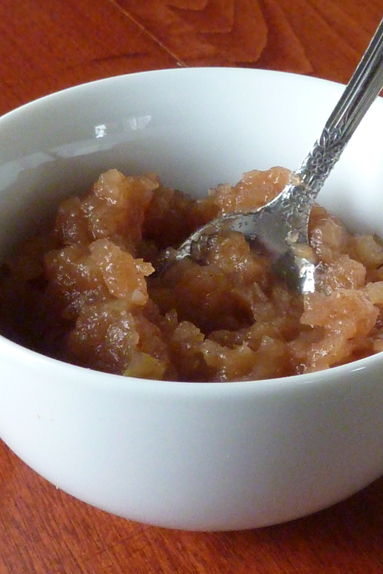 Excellent warm or cold, applesauce goes with any number of entrées, and also makes a great snack. Although it can be a bit time-consuming (especially if you are peeling and dicing by hand), making applesauce is very easy and very delicious. I like mine sweet and with lots of cinnamon, so make sure to play around with the proportions to suit your own tastes. Peel, core and slice apples. I use my apple/peeler/corer that was given to me, but it works just as well to cut them by hand. The smaller you dice them, the faster they’ll cook. Place apples into a pot and add water. Simmer, covered, on medium heat until apples are soft enough to stir. Add sugar and cinnamon, and stir until combined. Continue simmering until apples are soft to taste. This is also a good time to add more sugar or cinnamon as necessary. Notes: Step 2 can take anywhere from 5-30 minutes depending on how many apples you’re using and how small your apple pieces are. Also, a double recipe fits nicely into a 48oz peanut butter jar. YOU ARE BRILLIANT! I’ve never thought of making my own applesauce and have been sorely missing having it in my life since moving (it costs a ton in France!). I will definitely be trying this out after I go to the store this weekend! Fabulous, let me know how it goes!